Sony have just unveiled a new custom PSP for the Japanese market. 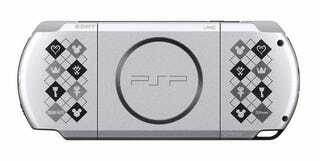 And it's a silver PSP-3000, covered in all kinds of stuff that will make sense only to fans of Kingdom Hearts: Birth By Sleep. It'll go on sale on January 9, 2010, and as part of a bundle including Kingdom Hearts: Birth By Sleep, will retail for ¥22,000 (USD$245). If you expect this to turn up in the US or Europe, you are living in a fantasy land.